It’s not soo long until Easter anymore and you may want to practise a little bit. That’s why the next days will deal with very different easter eggs. 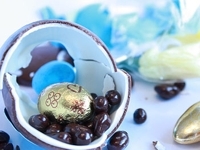 Today I’d like to present the chocolate Easter surprise egg, a stuffed chocolate egg in a real egg shell!